It’s my turn on the Splendid Sampler tour! Let me share about my block, Winter Flower. I have never been a gardener. I’ve tried. A little. But I got impatient with the delay between planting the seed and seeing the plant. I got frustrated with the weeds that sprung up no matter how many times I had pulled them out already. And I was at the mercy of my 2 year old (at the time) who thought my freshly dug soil was put to much better use as a home for his diggers and tip trucks. Pat asked me to have this block ready the week after we moved interstate to country Victoria almost 2 years ago. I had tried to get it done before the big day, but try as I might, my brain was full of boxes and cleaning and wondering if we were doing the right thing. We had the truck finally packed at 5pm on moving day and drove all the way to Bendigo, arriving at 3 in the morning. We parked the truck outside my brother’s house, snuck kids into beds where their kids already slept, and collapsed on their sofa. Man, that was a hard day. We needed to get the truck back to the truck hire depot by lunch, so we woke up early (for a 3am bedtime), and drove the last 45 minutes to our new home, another rental that Tim and I had looked through quickly a few weeks before, and that I hardly remembered what it looked like. We unloaded the truck into various rooms, leaving the unpacking and furniture assembly for another time, returned the truck, and came back home to assess the chaos. The first thing I did was unpack some quilts and lay them over our couches. I made myself a cup of tea and sat with them by the window. Then the flowers caught my eye. Dozens of beautiful yellow and white bulbs, planted by an anonymous gardener, left here as a gift for me. They were so happy and confident and bright. They had been invisible when we’d walked through quickly earlier that month, but here they were now, welcoming us home. I was so overwhelmed with gratitude for the effort that person had generously given, digging those bulbs into the ground however many winters ago. He or she had probably just done it for their own enjoyment, but their actions had much longer lasting effect. And I have not been so quick to dismiss gardening since! The next day, in a moment of quiet, I sat and sketched this block. To me, it’s like a welcoming flower, arms outstretched. There’s nothing like a happy and confident presence to give you courage and joy when you have to start over. I think quilts can be like that too, don’t you think? A welcoming gift, beauty in chaos, with long lasting greetings of comfort and hope. Winter Flower is my contribution to The Splendid Sampler 2 by Pat Sloan and Jane Davidson. It’s such a beautiful book! You can find my block on page 120. Share your block here to be in the running for this week’s prize, and join the stitching community here on Facebook! Well, my Lucy’s Terrace quilt is finally finished! I started it nearly 2 years ago, and it’s been my quilt to work on here and there, as inspiration struck, my quilt with no deadline. This was my quilt that made me realise that fussy cutting is a slow process for me. Quilts run smooth and fast (as fast as EPP goes) in my world when I can cut a million pieces at once from strips or scraps, baste in one or 2 long basting sessions, and then sew them together at random. This is not one of those quilts. But that doesn’t make it a terrible experience, just one where I have to give myself permission let the quilt choose it’s pace and walk along side it. There’s definitely something exciting about a quilt made fast with a tail wind of motivation driving you along. But there’s something incredibly satisfying about holding a slow quilt, knowing every part of it well, feeling a great sense of accomplishment. I made this quilt entirely from Maureen Cracknell’s Soulful collection. My first version of thsi quilt was made for Free Spirit, with each block, a seperate little feature of each designer’s new collection for that year. It was bright and colourful and a little clashy. So I wanted this one to feel more like lace doilies and pearls and velvet and crystal glasswear. I’m not sure why, it’s just a feeling that spoke to me when I decided to make this quilt again, and Maureen’s collection popped up in my feed. I think the fussy cutting and the vintage block design was calling to me for a more classic, detailed feel. And I think this collection was perfect for it. I backed the quilt with a beautiful woven fabric from Anna Maria Horner’s Loominous 2. I ordered several yards last year on special and I’ve been backing anything that goes with it! I hand quilted diagonally through the joining squares, and then again through the centre of the blocks. And then used an Amy Sinibaldi print from Dollhouse for binding. It’s all SO SOFT! I love it. I’m so glad to have it in my home as a quilt, rather than locked away in a tub on my WIP shelf. The Lucy’s Terrace and EPP kit are available here! Anyway, enough about the weather! I finished my Shallows Quilt today for Mister Domestic’s Aura Blog Party today. It’s a remake of a quilt I made for Quilter’s Companion magazine a couple of years ago in beautiful blues and golds. It’s been on my list of things to make again and turn into a proper pattern for so long, and was just waiting for the universe to scream, “NOW!” So when Mathew asked me to make something for his blog party, I instantly made the noisy universe-style connection between the ocean vibes of this quilt and the Hawaii influence of Mathew’s designs. I love it when that happens! When I told my 10 year old Tully that I was heading up to the train line for some photos, he offered to help and jumped on his bike to ride up ahead of us. He wanted to show me the beautiful graffiti under the bridge that I hadn’t noticed before. Isn’t he great? My last 2 photo shoots have had my kids holding my quilts. I think Tim’s pretty stoked that he might be out of a job! It’s a little bit harder for a 10 year old to hold a whole quilt straight against the wind, but a 10 year old is also more willing to climb up steep railway sides, and stand in the sun with his arms in the air a lot longer than a 35 year old. So it all evens out in the end! I have finally written a PDF pattern for this beautiful quilt! It’s here in the shop now! Simple, 2 shape quilts like this one can be pretty costly to kit up, so I’ve included the shape requirements in the listing to make it easy for you to purchase. The pattern also comes with printable templates is you prefer to buy your templates locally or hand piece without paper. I don’t usually get the same kind of buzz making a quilt twice, but I really enjoyed this one. I think a lot of it has to do with the energetic colours of Aura. And also the quick, easy repetitive progress, stitching these half hexie arrows together, was reassuring and fun. I’ve spent the summer finishing off the book, getting the kids back in school, feeling a bit out of routine and out of whack. So making this easy quilt, resting in Mathew’s happy colour palette, following instructions I’d made a while ago, I knew it was all going to come together. It’s been just the restorative make I’ve needed while the weather’s hot and time doesn’t feel like my own. This is a great beginner pattern if you haven’t tried EPP before and want something a little more modern than a hexie flower! The blocks are just two pieces and they sew into columns in easy, meditative waves, back and forth and back and forth. These are the very first quilt photos on our very first block of land. I can’t believe I get to say that! “Our very first block of land”. I’m not even sure it’s quite sunk in. Up until a little while ago, we had been pretty nomadic people. Idealistic, hopeful, dreamer-type people. We’ve chosen things over and over that meant saying no to our own home, things I can’t quite decide if I regret or not, now that I know how many of them turned out, but I also can’t imagine choosing anything different if I had my time over. 18 months ago, we moved to country Victoria, tired and disillusioned after 15 years of youth work. I think maybe we had been living a life that wasn’t really ours? One we thought we should be living. And there were many wonderful things, people, places, stories, in that life, but in the end, all those ideals had burdened us rather than given us joy. We plonked ourselves down in a random (yet lovely!) country town so that we could be on our own a little, and have really spent the last year and a half just trying to get from week to week. Somewhere in all the heartache and processing, though, we started to ask the questions we came here for in the first place. What do we want? What do we need? Who are we? And where the HECK are we going??! And out of the wrestle came the dream for this little block. A little part of the earth to call ours. To settle, to work, to grow things, and ourselves. A little block with a little house for a little start of the next chapter. A little start full of hope and rest. Not long after we decided that this is what we wanted, Tim’s dad came to visit and offered to help us with the deposit. It was such a wonderful, generous miracle. There’s no way we could have saved a deposit on our own. Our beautiful block comes complete with mature, private trees, a little creek at the front that runs in the wet season, and a whole lot of freedom to build our own sunny little home that we’ve designed ourselves, and a studio for the business. It’s so dry now, and I can’t wait to be able to give it some tender care. Settlement for the block happened last week and I have spent the week finishing up this quilt top, “Kindling”. It felt like such a good match for this part of the story. I named it Kindling because hexies are like a basic EPP ingredient. Like small sticks and leaves for starting a fire. And because “Kindle” means things like ‘to spark an idea” or to support something to grow. It also comes from the same root as words like kin, kindred, and to be kind. I’ll be putting a free pattern on my MAKE page once I quilt it up, and I think it’ll make a great starter quilt, or a gift for someone thought of or prayed for while stitching. I used 3” Hexagons and Maureen Cracknell’s Autumn Vibes collection for Art Gallery Fabrics. Autumn began here yesterday but it’s still so hot. I can’t wait for it to be cool enough to sit under this and hand quilt it! Hurray! We have a new club coming soon for 2019, and this one is super special! If you follow me on Instagram, you may have seen my stitching progress, and snagged yourself a free block. Keep reading for a quick tutorial for putting it together! “Alexandria” is a copy of an Australian Quilt made in the late 1800s from British soldiers’ uniforms. I first discovered it in an historic quilts book years ago and it inspired me to take up EPP again after a few slow and meandering hexie quilt attempts. Before this quilt, I wasn’t so sure of English Paper Piecing. 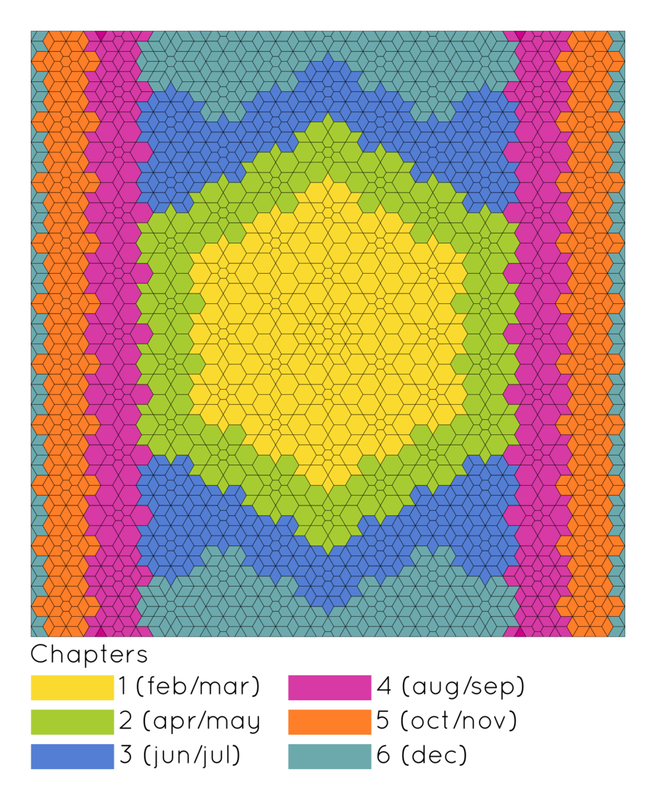 I was making my own templates, thread basting, and adding hexies to a slowly growing blob at random. I didn’t really have a clear sense of progress, or how to stitch hexagons together to make it quicker and easier (like rows!). But then I began what I named, Nana MacIntyre’s quilt, after the lady who inherited the quilt in Albury, NSW. I started with 1” hexies, which I was cutting with a special hole punch, and I bought the jewels and diamonds. That sizing, I later discovered, was a pretty big mistake (I didn’t know this, but the original was made from 3/4” and 1 1/2” shapes, or similar). But at the time, I just enjoyed the process of making one block after another. I took basted shapes in little ziplock bags to meetings, I stitched them in the evening by the fire rather than retreating to my freezing cold sewing room, I experimented with ways to baste and construct, and found favourites. I realised that EPP suits me pretty well. Isn’t Lucy’s progress above amazing! I just love green! If you look closely, you’ll notice that Lucy’s quilt is scrappy, but in colour blocks, or sections. She’s followed a similar splitting of panels to the original but every piece is a different fabric to the one next to it. I’m following a different path this time. My blocks will be 3-4 colours each, with the same colour for each jewel, diamond, etc in each block, but I won’t be following a colour pattern over the quilt, except for the centre medallion. I’ll be using scraps and stash for mine. I felt daunted at the idea of coming up with a specific colour palette (something Lucy is really good at), and so I’m excited about the idea of dropping the need for too much planning, and using up my scraps! Want to know more? Here are the quilt details and how to join in! This is our biggest quilt club quilt yet, but we hope you don’t feel daunted! There’s never any pressure, competition, etc. in my clubs. Stitch for enjoyment and go at your own pace. Throughout the year I’ll share handy tips for planning, making progress, and understanding what works well with your quilty personality. We’ll also be stitching the blocks into panels and adding them to the centre as we go, so once you get to the end, instead of ending the year with 100 blocks needing to be stitched together, you’ll be adding the last edge pieces to your quilt top! Skill Level: Intermediate. I recommend this project for people who’ve done EPP before and are comfortable with basting and stitching. The quilt isn’t difficult, but it does allow for lots of variations in colour, and therefore construction. 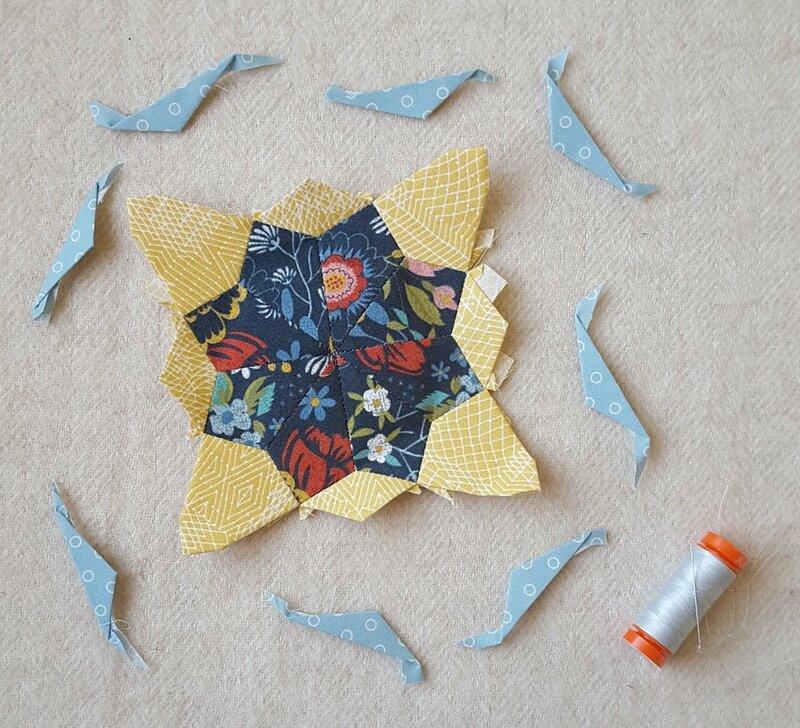 Mostly you’ll be sewing pieces together in simple blocks, but if you have a medallion round coloured in a certain way, you can alter the way you put it together. Having a little experience in EPP quilt making will help you make those decisions as you go. Start planning your quilt by printing off the colouring-in sheet here! Sign ups will open in my shop between Friday 1st February 2019 and Thursday 14th February 2019. The pieces for this club will be mailed out every second month in 6 ‘chapters’ and you’ll receive enough pieces to make a section of the quilt over that 2 month period. Below is the plan for the year! Papers: AUD$29 charged every second month. Free postage in Australia, $3.50 international shipping. Opt out anytime. Your account will be charged February, April, June, August, October, December on the 10th of these months. 6 payments total. Stitching Buddies bundle: Sign up for 2 packs each month so that you can stitch with a friend! $49 every second month. Free postage everywhere! Only 1 account will be charged the whole amount each time and the 2 bundles will be sent to the one address. Your account will be charged February, April, June, August, October, December on the 10th of these months. 6 payments total. This would make a great birthday present or thank you gift! You can opt out anytime, or switch to a single papers pack if one of you changes their mind. Upfront: $149, one payment, paid in February for the whole club. No refunds or opting out for this one, but you do get 1 month free, and free international shipping all year! Each mail out, you’ll receive enough papers for the section of the quilt we’ll be making, and I’ll send out an email with the pattern. At the end of the year, you’ll receive a PDF copy of the whole pattern to keep. Acrylic Templates are sold separately here. This year we’re not offering fabric bundles, so it’s good to have an idea of the fabric you might need. It’s tricky to nail down exact fabric requirements for this quilt because it depends largely on if you work in colour sections, fussy cut, or use scraps. I cut a 2” strip for the 1 1/2” diamonds. You can fit 18 diamonds on a WOF strip. I think I’m going to use the same print for the diamonds between blocks outside of the medallion (they’re in red in the original, in the black background section.) I’ve counted 284 of these diamonds. 284/18 = a little under 18. So I need (18) 2” strips. That’s 36”, or a yard. So I might buy, or make sure I have in stash, 1 1/4 yds of joining fabric. Later in the quilt, the blocks have a round of 6 diamonds around the jewel star, followed by another round of 12 diamonds. If you’re making your quilt scrappy, you can use a whole WOF strip to cut 6 diamonds for one block, and 12 diamonds for another. You can cut the 3/4” jewels (measured along the short side) from 2” strips or 2 1/2” strips. (See image above for the different ways you can lay them out.) 2 1/2” strips are great for directional fabric. If you have stripey fabric, for example, and you cut it like the light green fabric above, all of your stripes will radiate out from the hexie, or border the hexie, depending on which way your stripe sits on the fabric. The little hexies fit inside a 2” square. If you end up with scraps at the end of a 2” strip that you’ve cut for diamonds of jewels, keep them for 3/4” hexies! If you’re fussy cutting, the blocks need 6 repeats on a piece of fabric for the jewels, hexies, or the ring of diamonds. How much fabric you need depends on how spread out the design is. I recommend trying half yard cuts and medium sized prints. Small scattered florals, like the little Heather Ross roses above, are great for fussy cutting without needing lots of repeats. Just centre the acrylic template over the motif and draw around it with a ball point pen to make your cutting line. (You can use a rotary cutter, but for small shapes like this, it’s safer to draw the outline and cut with scissors.) If you use a mix of feature prints and basics, like Lucy has above, you’ll get great use of your stash. Lots of people ordered their free block from my shop the other week! Thank you! Make your block by Feb 13, share it on Instagram with the hashtag #alexandriaquilt and @talesofcloth. Then email the link to hello@talesofcloth.com and we’ll send you a discount code to get $15 off your first chapter, or your upfront total! Stitch the short, centre edges of the jewels around the hexie. Stitch the seams between the jewels. Stitch the round of 6 diamonds between the jewels to make a large hexagon block. Stitch the next round of diamonds into pairs to make little arrows. 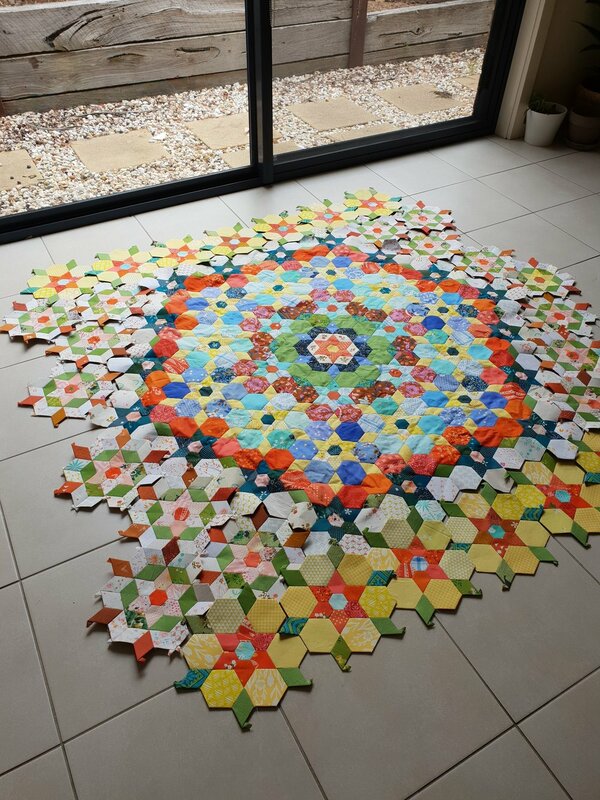 Stitch them around the hexagon block. Stitch the last bunch of diamonds into the gaps at the point of each jewel. Lucy made her diamonds into hexagons (the rose print and the outside diamonds made into an arrow) before stitching them around the jewels. Kata showed me how she followed Lucy’s method above, and then added the extra, pointing-out diamond to the right side of the hexagon. The she stitched these around the jewels. I can’t wait to stitch with you this year! I think this will be our best one yet!